If you would prefer to receive an information pack please email me at admin@ds23.co.nz with your postal address, the model you wish to register and I will mail one to you. Please note that registrations will close June 30. The DS turns 60 this year. The organisers of the 50th run have been busy for some time coming up with an interesting proposal for a meaningful celebration. We intend to combine two of our bucket list items with this celebration. The plan is to drive from Cape Reinga to the Bluff (BL 1) using the approximate route taken by the Mini in the "Goodbye Pork Pie" film (BL 2). 1. The run will take place during October 2015, from Thursday 22 to Wednesday 28. 2. Participants can do the full tour or join and leave as they wish. 3. Any Citroen car is welcome to take part, in fact any car is welcome. 4. 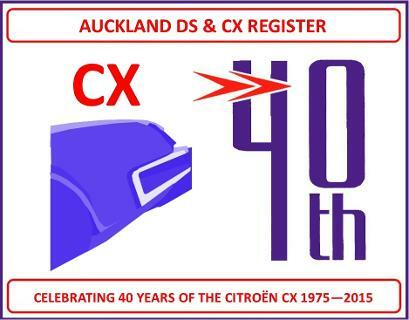 We will be celebrating the ID/DS (60th), the GS/GSA (45th), the CX (40th plus 1) and the BX (33rd) So start getting them ready now. 5. Tour participants will be responsible for arranging their own accommodation, meals, ferry crossing(s) etc etc. We will provide a list of suggested motels that can be booked at each overnight stop. 6. All information will be loaded onto the site as soon as it is available. We plan to reduce organisation costs as much as possible. All information will be available for you to print or download directly from the various pages above. The "Downloads" page will have all the files you will need. We would like to place a call to all Citroen Car Clubs on the Route to be involved in the planning of the tour as we pass through your area. If a Club would like to be involved please email me Jeremy Adams milou@xtra.co.nz. Have an enjoyable break over the festive season and keep watching this space for developments. If you know anyone who you think maybe interested in this D-Tour please pass this information on to them. You can get full details of the tour by visiting the DS 23 website ( www.ds23.co.nz), just click on the banner above to visit the site. I have also added a downloads page to the sub menu (above) to this site where you will find all relevant downloads, especially the registration forms.